I might get some trouble for reviewing a family film in the 31 Days of “Horror” category for the month of October, but I should stress. These posts are meant as a celebration of horror, and in that way, Monsters, Inc. is very fitting. Pixar is a brand name all its own these days, about as recognizable as the name of its owner, Disney. 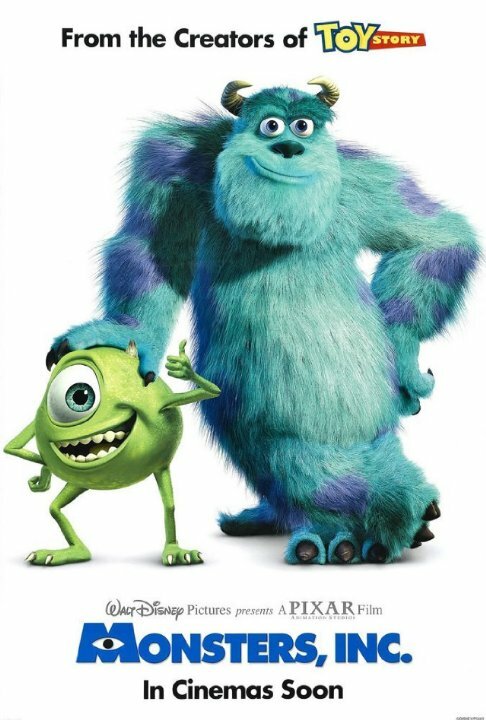 Known for creating fully realized worlds that are capable of translating highly complex moral questions, Pixar is perhaps most well known to me for the creation of Monsters, Inc., a gorgeous little gem from 2001. It tells the story of James P. Sullivan or “Sully” (John Goodman, TV’s Roseanne, Transformers: Age of Extinction) and his roommate and best friend Mike Wazowski (Billy Crystal, When Harry Met Sally…, Parental Guidance), two monsters existing in a world parallel to our own, in which their main source of power and energy comes from human children’s screams. It isn’t an easy job scaring the screams out of kids anymore, especially when a single touch could kill you. But when a child called Boo (Mary Gibbs, The Lion King 2: Simba’s Pride) is found after hours in Monsters Incorporated, where Mike and Sully work, the two find themselves in quite a pickle trying to right the many wrongs and solve the mystery of why she is there. Mike and Sully have to discover while how fellow scarer Randall Boggs (Steve Buscemi, TV’s Boardwalk Empire, Fargo) is involved, get the information to boss Henry J. Waternoose (James Coburn, The Great Escape, Snow Dogs), and avoid Mike’s girlfriend (for her own safety), Celia (Jennifer Tilly, TV’s Family Guy, Bound). 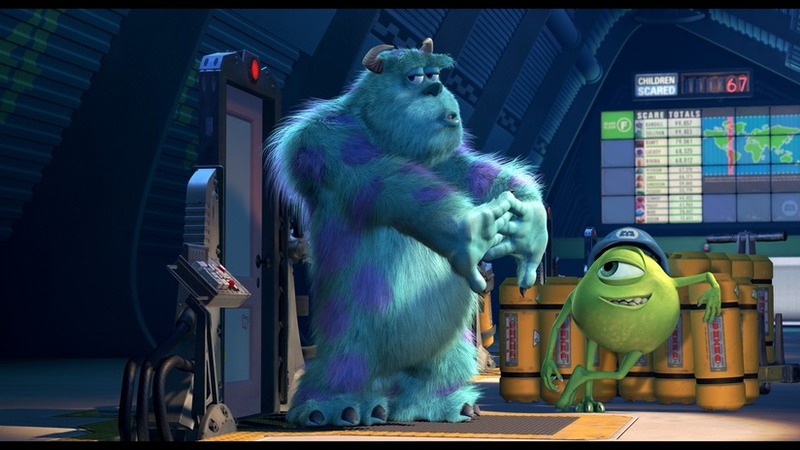 Monsters, Inc. is one of the best films in Pixar’s roster (my personal favorite, in fact). The voice work from Goodman and Crystal (who actually recorded lines together, a rarity in the voice work business) is phenomenal. The animation here is top notch for its time and still looks pretty good for being over thirteen years old. The pacing on the film is another major take-away. It never misses a beat. Even the musical score just stays with you; this whole film does. Enjoy watching this film if you haven’t already seen it; it plays with the mythos as well as pulling at the right heart strings, and it pours a couple dashes of The China Syndrome in for good measure. 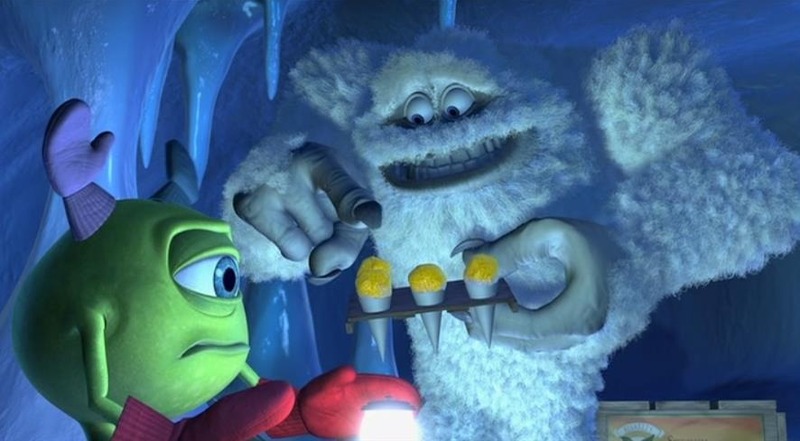 Take a moment to enjoy some of the little in-jokes that Monsters, Inc. has to offer. Notice that Randall Boggs threatens to throw someone into a wood chipper (a fate he isn’t all too unfamiliar with himself from his work with the Coen brothers). Laugh at Mike’s chair during the employee theatrical performance of “Put That Thing Back Where It Came From or So Help Me” (it happens to resemble one Krang’s chair from the Teenage Mutant Ninja Turtles cartoon). The best little homage in-joke comes from the restaurant Harryhausen’s, which takes its name from Ray Harryhausen, famous stop-motion creature maker known for Clash of the Titans and Jason and the Argonauts. Also, when Harryhausen made the film It Came from Beneath the Sea, he only had the budget for a six-tentacled octopus, which appears as a chef in the restaurant named for him in Monsters, Inc. Isn’t learning fun? What a terrific film, I was so excited to revisit it for the 31 Days of Horror and I hope you will view it yourself, either for the first time or the 1000th. 31 Days of Horror – Extra Bits: [Take 5] Horror Musicals!